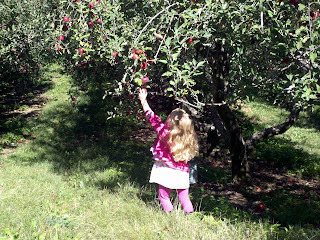 My daughter and I made our annual trip to the Apple farm that is conveniently located a mile away from our home. I love apple picking but what I love even more this year is seeing my daughters excitement when she realized that she was tall enough to reach some of the low lying apples. She couldn't stop giggling. We left the farm with 28 lbs of apples ready for eating, apple sauce and pies. We decided to start with applesauce as this was something that I knew a very busy and helpful 4 year old could help me with. Next core and slice the apples. I left the skins on as I have a food mill. 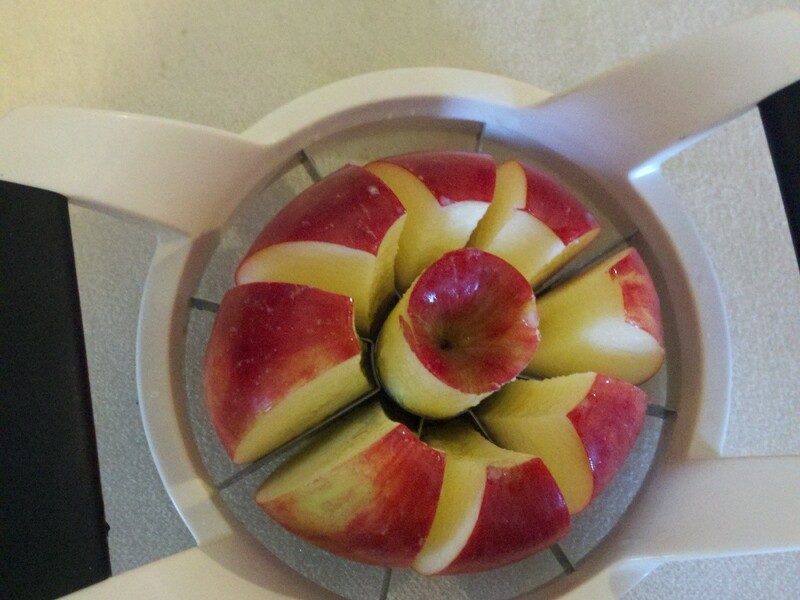 If you do not have a food mill, peal the apples before cooking. I failed to take a picture of the apples while they are cooking. I'm sure all of you can imagine apple slices in a pot...cooking. Be warned that at this moment, your house smells delicious. It will make everyone mouth water. Cook the apples until soft and mushy. About 10-15 minutes. Be sure to stir often as to not scorch the apples on the bottom. Please note that I did not measure the amount of apples I was using. I filled a 7.5 quart french oven with enough room to allow me to stir the apples. 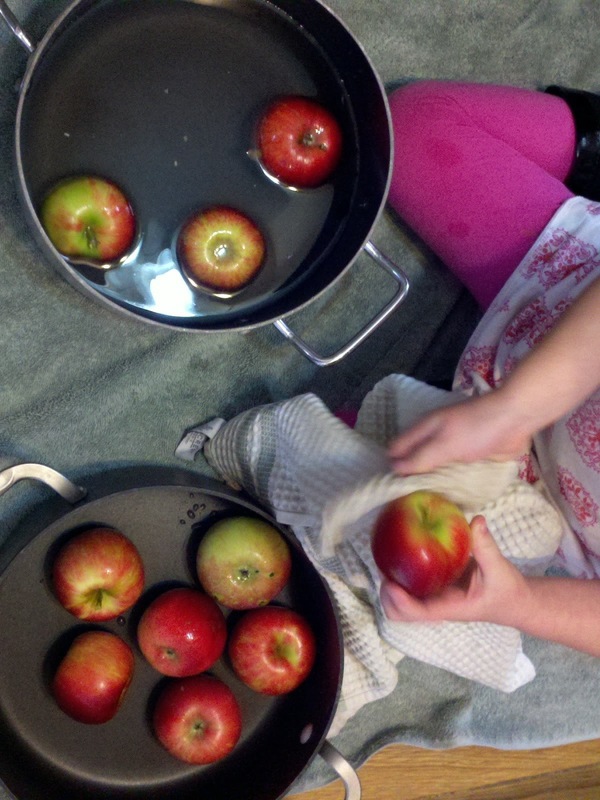 Once the apples are soft and mushy, run them through a food mill. (If you peeled the apples ahead of time, you can use a masher, a hand mixer, food processor, something to puree the apples.) The food mill will remove most of the skins. At this point, I highly recommend sticking a spoon into the bowl of hot freshly pureed apple sauce and taste. Be sure not to burn yourself as it might be piping hot. Repeat as necessary. 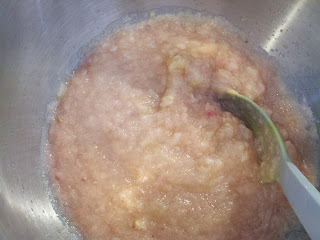 This is what the apple sauce will look like once pureed. Be sure to have your jars sterilized and in hot boiling water before canning. 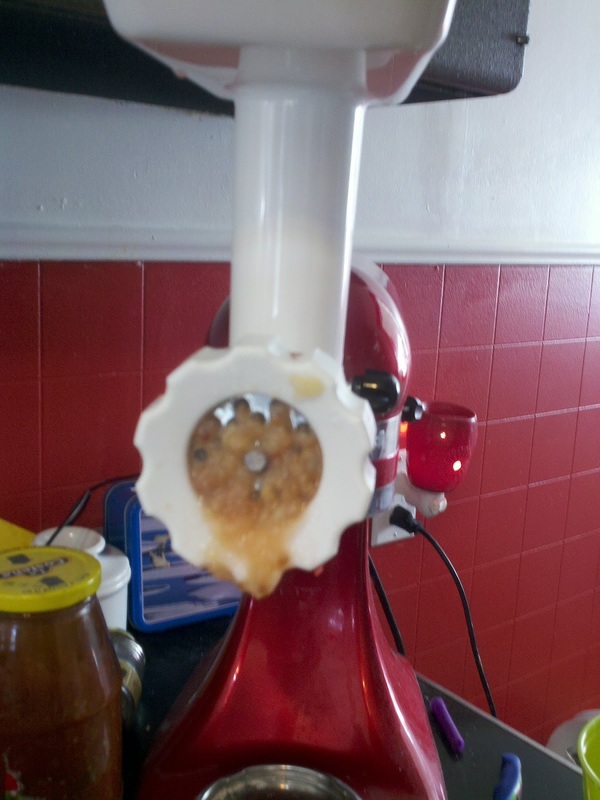 Remove the jars from the hot water and fill with applesauce using 1/2 inch head room. 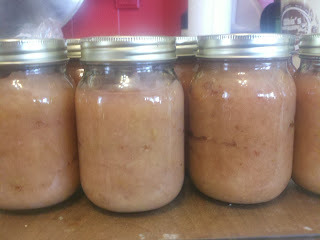 (I used pints and my 7.5 quart french oven produced 5 pints of applesauce). Seal and water bath for 20 minutes at 1000 altitude. Now some people add sugar, red hots, juice, water or even cinnamon. The only thing that I added to 1/2 of the jars was cinnamon. I mixed it in after I pureed the apples. It was delicious. My daughter snagged a bowl of the sauce right before I canned it which is evidence that it is good. Have fun making applesauce. If I can avoid it, I will never buy store bought again. Wow! I've never made applesauce before, but this looks amazing!! So for apples, there is no need to add lemon juice for canning? Hi Meems, from what I have read, there generally is no need for lemon juice when using higher quality apples. However, the addition of lemon juice has been an highly recommend suggestion to recipes after 2007 because of the increased amount of hybrid and lower nutritional apples that are on the market. This is to ensure the acidity level of the sauce and to preserve color. Since we pick our apples from a 20+ year old farm with well established trees, I wasn't too concerned about the quality of the apples and don't mind too much about discoloration. We will eat the applesauce too quick to see much difference. I'm pretty sure you are equally as particular about the quality of your fruits and veggies so it probably won't be an issue at all for you. Here is a list that gives a suggestion of apple types that are good for sauce http://www.pickyourown.org/apples.htm.